On April 9, 2015, the Administrative Appeals Office (AAO) decision in Matter of Christos, Inc., 26 I&N Dec. 537 (AAO 2015) [PDF version], was published as a precedent decision. The decision had originally been entered by the AAO on August 12, 2013, but it was reopened on the motion of the AAO for making limited revisions for purpose of its designation as a precedent decision. In Matter of Christos, Inc., the AAO addressed an alien who submitted false documents representing a nonexistent or fictitious marriage, but who never entered into, attempted to enter into, or conspired to enter into the marriage. The AAO held that, while the alien may be determined to have acted with the intent to evade the immigration laws, the alien is not, by virtue of the submission of the false documentation alone, considered to have “entered into” or to have “attempted to enter into” a marriage for purpose of section 204(c) of the Immigration Nationality Act (INA). However, the AAO also held that misrepresentations relating to a nonexistent or fictitious marriage may cause inadmissibility under section 212(a)(6)(C)(i) of the INA for fraud or misrepresentation of a material fact. In this article, we will examine the factual and procedural history of Matter of Christos, Inc., the AAO's analysis and conclusions, and what the decision means as binding precedent. Please see our full articles about marriage fraud [see article] and relief from marriage fraud [see article] to learn more about related issues. The petitioner in Matter of Christos, Inc. was a restaurant that sought to employ the beneficiary permanently in the United States as a cook. It filed a Form I-140, Petition for Immigrant Worker on behalf of the beneficiary under section 203(b)(3) of the INA (employment-based third preference). The Department of Labor (DOL) approved the petitioner's Form ETA-750, Application for Alien Labor Certification. Although the Form I-140 had initially been approved, upon review the Director of the Vermont Service Center (VSC) revoked the approval. The VSC Director determined that the petitioner did not establish that the beneficiary had the minimum experience required by the labor certification. Upon review, the AAO affirmed the VSC Director's decision regarding the beneficiary's qualifications. The AAO had also concluded that the Form I-140 could not be approved because the beneficiary was subject to section 204(c) of the INA, which prevents an individual from having an immigrant visa petition under section 204(b) approved on his or her behalf if the individual either entered into or conspired to enter into a sham marriage. The record before the AAO on that appeal indicated that the beneficiary of the Form I-140 was also the beneficiary of a separate marriage-based Form I-130, Petition for Alien Relative that had been filed in Massachusetts. A Form I-485, Application to Register Permanent Residence or Adjust Status, had also been filed with the Form I-130. The beneficiary indicated to the USCIS that the Form I-130 was fictitious and that he had never met or married the petitioner. The USCIS had denied the Form I-130 as abandoned and the Form I-485 on the basis that the beneficiary was inadmissible for willful misrepresentation of a material fact on the Form I-130 under section 212(a)(6)(C)(i) of the INA. In the VSC Director's initial decision on revoking the Form I-140, he observed that the petition could not be approved by virtue of the applicability of section 204(c). However, the VSC director did not “include a determination regarding 204(c) in the ultimate revocation decision.” When the AAO initially reviewed the VSC Director's decision, it determined that the approval of the Form I-140 must be revoked “because substantial and probative evidence supported a reasonable inference that the beneficiary conspired to enter into a prior marriage for purpose of evading the immigration laws.” Accordingly, the AAO determined that revocation was required both on the basis of the beneficiary's lack of qualifications for the position and under section 204(c). The AAO reopened the matter and permitted the petitioner to submit a supplemental brief and additional evidence as provided in 8 C.F.R. 103.5(a)(5)(ii) (2014). The AAO considered both the petitioner's qualifications and the applicability of the section 204(c) marriage fraud bar. We will focus primarily on the AAO's analysis of the applicability of the section 204(c) marriage fraud, which is undoubtedly the primary reason why Matter of Christos, Inc. was selected for publication as a precedent decision. In the following sub-sections, we will examine the AAO's analysis and conclusions and explain why it decided to sustain the approval petitioner's Form I-140 petition and reinstate the approval of the petitioner's Form ETA-750, Application for Alien Labor Certification. The AAO explained that section 203(b)(3)(A)(i) of the INA “provides for visa preference classification of immigrants who are qualified to perform 'skilled labor (requiring at least 2 years [of] training or experience), not of a temporary or seasonal nature, for which qualified workers are not available in the United States. '” Citing to the precedent decision Matter of Wing's Tea House, 16 I&N Dec. 158, 160 (Acting R.C. 1977) [PDF version], the AAO explained that a beneficiary must meet all of the education, training, and experience requirements specified on the labor certification application as of the petition's priority date. The AAO examined two administrative precedent decisions that predated the enactment of the IMFA. In Matter of Anselmo, 16 I&N Dec. 152, 153 (BIA 1977) [PDF version], the Board held that the former provision did not apply in the absence of an actual marriage. In Matter of Concepcion, 16 I&N Dec. 10, 11 (BIA 1976) [PDF version], the Board held that the former provision did not apply to an alien who had falsified marriage documents but never married because “it cannot be determined that she obtained immediate relative status on the basis of a marriage entered into for the purpose of evading the immigration laws” (AAO quoting from 16 I&N Dec. at 11). Examining the language of the current section 204(c) marriage fraud bar, the AAO found that, by its plain language, it applies only to an alien who “entered into” or “attempted or conspired” to enter into a marriage to evade the immigration laws. In short, the AAO followed Matter of Concepcion in finding that merely falsifying documents does not, in and of itself, trigger the marriage fraud bar. 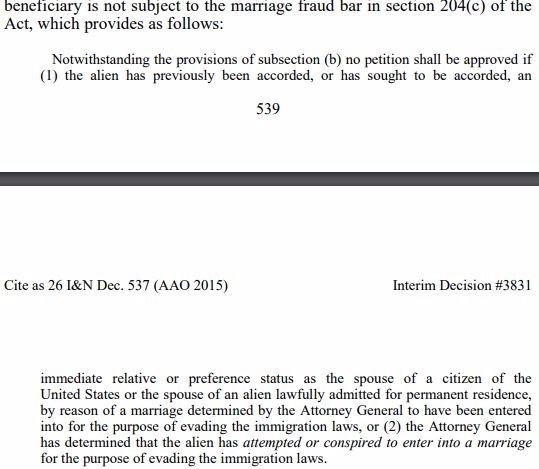 Even under the current section 204(c), the alien must, if not entered into a sham marriage, have “attempted or conspired” to enter into such a marriage. The AAO's holding in the instant case makes clear that merely falsifying documents pertaining to a nonexistent or fictitious marriage does not trigger section 204(c) in and of itself. Significantly, the AAO placed the burden on the alien who has submitted such falsified documents pertaining to a nonexistent or fictitious marriage to “credibly” establish that he or she neither entered into nor attempted or conspire to enter into the purported marriage. However, although submitting false documents pertaining to a nonexistent or fictitious marriage does not necessarily trigger the marriage fraud bar, it may nevertheless trigger inadmissibility under section 212(a)(6)(C)(i) of the INA for fraud or willful misrepresentation of a material fact in order to procure any immigration benefit. The AAO explained that “such conduct may render the beneficiary inadmissibile under section 212(a)(6)(C)(i) … when the Director adjudicates the Form I-485.” Accordingly, while the petitioner satisfied its burden for approval of the Form I-140 in the instant case, that did not necessarily mean that the beneficiary would be found to be admissible during adjudication of the Form I-485. In Matter of O-, 8 I&N Dec. 295 (BIA 1959) [PDF version], the Board held that the visa petition procedure is not the appropriate forum for determining whether an alien is inadmissible. Applying the foregoing analysis, the AAO determined that the beneficiary credibly established that he had not entered into the marriage for which he submitted false documents nor did he conspire or attempt to do so. Accordingly, it found that section 204(c) did not apply. The AAO determined that the petitioner met its burden and sustained its appeal. Matter of Christos, Inc., makes clear that the marriage fraud bar does not reach cases in which an alien only submits false documents pertaining to a fictitious or nonexistent marriage. The decision explicitly follows the BIA decision in Matter of Concepcion, 16 I&N Dec. 10 (BIA 1976), although Concepcion dealt with a narrower version of the marriage fraud bar. However, it is important to note that whether 204(c) applies depends on the facts of a given case. While the beneficiary in the instant case was able to credibly establish that he had not entered into or attempted or conspire to enter into the purported marriage, whether an individual in a different case would be able to do the same would depend on the facts of that case. In another key point, the AAO distinguished between the approval of a petition and the determination of whether the beneficiary is admissible. Section 204(c) is considered during the adjudication of the petition. Accordingly, because the beneficiary credibly established that he was not subject to the section 204(c) marriage fraud bar and the petitioner established that the other requirements for approval were met, the Form I-140 was approved. However, an admissibility determination would be made in the event that the beneficiary applied for a visa or adjustment of status by filing the Form I-485. As the AAO explained, while the beneficiary was not subject to section 204(c) based on his submission of false documents relating to a nonexistent or fictitious marriage, this did not foreclose the possibility that he would be found to be inadmissible under section 212(a)(6)(C)(i) of the INA based on the filing of those documents. That determination would have to wait for the adjudication of the Form I-485. Petitioners and beneficiaries should consult with an experienced immigration attorney involving immigrant visa petitions. In the case of an alien with issues that may implicate marriage fraud, it is especially important to consult with an experienced immigration attorney immediately for a case-specific consultation. Finally, although the Form I-140 in the instant case was approved, the decision served as another of many examples showing the serious and sometimes permanent consequences that an alien may face for attempting to procure immigration benefits through fraud or misrepresentation.